WASHINGTON, D.C. — US Senator John McCain, who is widely known for his support of the Kurdish people, died on Saturday at the age of 81. In October 2017, shortly after Iran-backed Shiite militias helped the Iraqi Army take the oil-rich city of Kirkuk from the control of Peshmerga, McCain wrote an Op-Ed for the New York Times, calling for Washington to stand behind the Kurds. McCain was a Republican, Vietnam War veteran, prisoner of war, and Purple Heart recipient. He died at 4:28 p.m. (local time) on Saturday at his home in Sedona, Arizona, according to his family. He had suffered from a malignant brain tumor, called a glioblastoma, for which has been treated since 2017. Just a few days before, he announced that he would no longer seek treatment. In 2014 at the start of the ISIS conflict, he visited the Kurdistan Region, meeting with KRG Prime Minister Nechirvan Barzani and President Masoud Barzani. McCain chaired the Senate Armed Services Committee and actively hosted delegations of Kurdish officials from the Kurdistan Region. PM Barzani released a statement, saying McCain was a great defender of the Kurds who will forever honor his memory. “I was saddened by the death of great American patriot, veteran politician and friend of the Kurds Senator John McCain,” Prime Minister Barzani said on Sunday. Barzani said that McCain’s death was a loss for the people of Kurdistan. 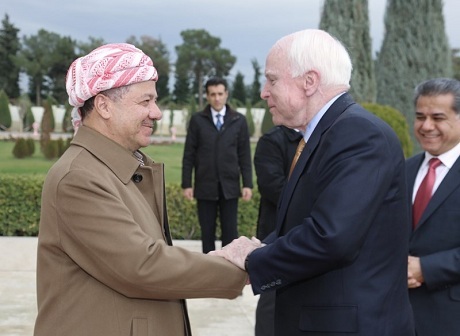 Barzani, the president of the KDP, tweeted that McCain's support and friendship will remain with the people of Kurdistan. Deeply saddened to know of the death of Senator John McCain whose support for, and friendship with, the people of Kurdistan shall remain in our memory, May he rest in eternal peace. KRG Deputy Prime Minister Qubad Talabani tweeted McCain was able to cross party lines and a patriot. Head of the Kurdistan Region Security Council, Masrour Barzani, said he was deeply saddened by McCain's passing who was a "champion and friend of the Kurdish people." I'm deeply saddened by the passing of Senator John McCain. John was a champion and friend of the Kurdish people. He will be missed dearly. My thoughts are with his family- mb. "Kurdistan lost a great friend and ally," tweeted Falah Mustafa, the head of the KRG Department of Foreign Relations. Bayan Sami Abdulrahman, the KRG representative to the US, sent her office's condolences to his family. Hazhar Ismail, the director of coordination and relations in the Ministry of Peshmerga, called McCain one "of the best Kurdish friends." "I send my deepest condolences to the entire McCain family and all US friends on the passing of Senator John McCain. He was one of the best Kurdish friends," he wrote. KRG Representative to the United States Bayan Sami Abdul Rahman said: “The people of Kurdistan are fortunate that we have bipartisan support in the US Congress and Senator John McCain has been among our strongest and staunchest supporters. He stood by us when the Peshmerga needed weapons and he spoke out against the escalation of tensions between Kurdistan and the federal government of Iraq after Kurdistan independence referendum in 2017. “But that support didn’t come easily. In every meeting with KRG officials, in Washington or during his visits to Kurdistan, he questioned and assessed, he took in information and asked for more details. In 2017, McCain made a secret visit to Kobane, while Kurdish forces who were backed by the US-led international anti-ISIS coalition, routed the extremists from northern Syria. US President Donald Trump sent his sympathies to the McCain family. "Our hearts and prayers are with you!" he tweeted. Previous US President Barack Obama, a Democrat, noted that despite their differences, McCain was respected for being patriotic and putting the nation's interests above their own. Former US President George W. Bush released a statement saying McCain upheld the finest American traditions. “John McCain was a man of deep conviction and a patriot of the highest order. He was a public servant in the finest traditions of our country. And to me, he was a friend whom I’ll deeply miss,” the Republican who was challenged by McCain in the 1999 party preliminaries wrote. Bush extended sympathies to Cindy McCain and the couple’s children. “Some lives are so vivid, it is difficult to imagine them ended. It is hard to think of them stilled,” Bush added. My condolences to McCain family. He was a true friend of kurds. Correction on his military service, he was a Vietnam War veteran not Korean War. Pro-Kurdish? Be professional. What amateur wrote this?? RIP John McCain, a man with honor, true warhero and friend of the kurds!